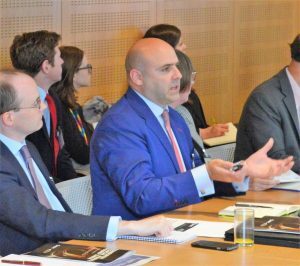 The 16th Edinburgh Ethical Finance Round Table took place in the offices of Baillie Gifford on Monday 18th June 2018. The focus this time round was on government policy comparing the Scottish Government approach and the approach being taken in Ireland. The first speaker was Karen Rodger, who is the Scottish Government’s policy lead in the areas of financial services and fintech. 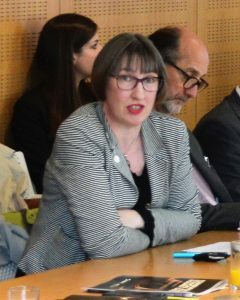 Karen began by emphasising that the Scottish Government very much saw its relationship with the financial sector in terms of a partnership. The overall target is inclusive growth, i.e. creating opportunities for increased national prosperity which will be distributed fairly. At the heart of the Government’s route to achieving this is the “National Performance Framework”, which explicitly aligns all Government policies and initiatives with the UN SDGs. Examples of specific initiatives include the establishment of the Scottish National Investment Bank (SNIB), in which the Government is committed to investing £2bn over the next 10 years, aiming to leverage further capital from the private sector, and the Financial Services Advisory Board, set up in 2005 as a public-private collaboration and which now includes in its strategy the “National Partnership for Social Impact”. Most recently the Scottish Government has also established “Fintech Scotland”, with the ambitious aim of making Scotland one of the global top five centres for fintech (it currently ranks 15th). Finally, Karen reminded the group that the Government had demonstrated support for its work in providing the initial funding for the Ethical Finance Hub, now established within the Edinburgh Business School at Heriot-Watt University. The second presentation was given by Stephen Nolan, the CEO of Sustainable Nation Ireland (SNI). SNI had come about in partnership between the public and private sectors as a tool towards sustainable development. Its overall aim is to position Ireland as a hub for sustainable finance, while working to attract co-investors in the move towards a decarbonised economy, which to achieve by 2030 it is estimated will require €50bn. Later this year the Irish Government would be launching its “National Development Plan for Ireland”, to which it was committing €22bn. The current overall size of the “green finance” market in Ireland was estimated at €28bn, including infrastructure and other investment funds, equities and green bonds. 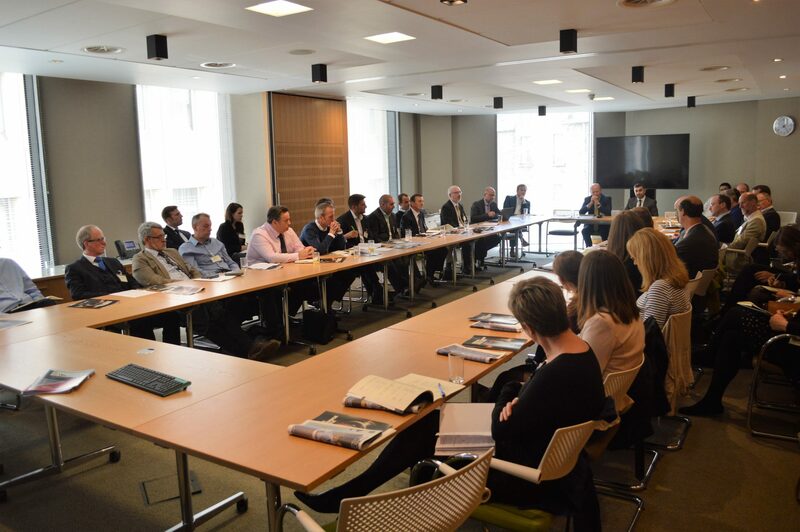 An exciting new development was SNI’s role in establishing and running a new European project to bring together 30+ centres crucial in channelling capital to enable the transition to a low-carbon, inclusive and sustainable economy. The EU-FC4S Hub is the mechanism to make this happen and, on account of its role in the development of both sustainable investment policies and carbon reduction strategies, Edinburgh has been chosen as the first city to engage with. A number of question and comments came from the floor, including an extended discussion on financial education and how best to engender the necessary skills in the financial workforce, on which Karen Rodger raised the possibility of developing specialised financial apprenticeships. Stephen Nolan made the point that the major changes that decarbonisation entailed would inevitably produce winners and losers and that governments had to be alert to addressing the consequences. Participants raised the interesting issue of how to develop better overall frameworks for city development, as opposed to simply proceeding by way of individual infrastructure projects. Stephen Nolan pointed to the Irish Strategic Investment Fund as having some success in this area while Karen indicated she saw SNIB as playing a part in improving the Scottish picture. The meeting concluded with an update from Omar Shaikh on forthcoming events of interest, including a ethical finance conference scheduled to take place in Edinburgh in October. He also introduced Jamie Ervin, visiting from the UN’s Development Programme, who gave a brief introduction to their work and the current exploration of a possible partnership between their team and the Ethical Finance Hub. Please CLICK HERE to access the round table slides.